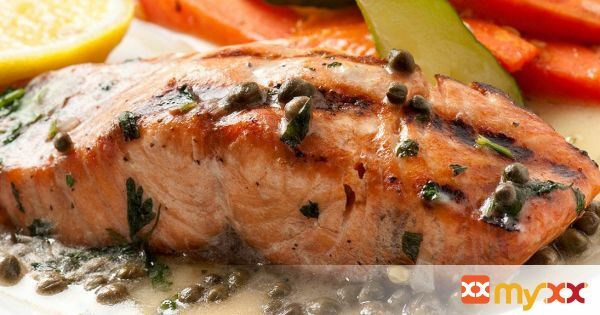 Salmon Piccata- capers, lemons, white wine and garlic make up this traditional piccata dish. 1. In a large no-stick sauté pan, melt the butter over medium-high heat. 2. Flour and dust the salmon fillets and place them in the sauté pan. Cook the fillets for 2 minutes, turning the fillets once. 3. Add the garlic and pepper to the pan and when the garlic starts to turn brown, deglaze with the wine. Add the chicken broth and capers and reduce by half. 4. Turn the fish one more time and squeeze half the lemon over the fillets and sauce. 5. Remove and garnish with lemon slices and parsley.